For the 2019 United States Moto GP™, F1 Grand Prix Tours can provide you with a great opportunity to experience the United States Moto GP™, as well as the sights, sounds and people of Austin, at an affordable tour package price. We can offer you tour accommodation in a superior 3 and 1/2 star hotel in Austin, ideally located within easy within easy reach (2,5 miles) of Austin’s world famous Sixth Street, boasting the city’s finest restaurants, nightclubs and shopping outlets. Your hotel accommodation, combined with your race tickets, will form the basis of an unforgettable 2019 United States Moto GP™ travel package. You must book a minimum of 3-night United States Moto GP™ tour package, which may be extended on request, to give you more time to explore the capital of Austin and the area’s numerous tourist attractions. 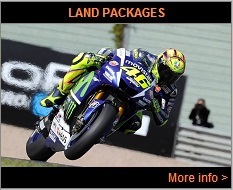 An ideal base for your 2019 United States Moto GP™ tour and travel package!